Dr. Larry and Joanie Genender have been longtime supporters of St. Mark’s since 1979, when they enrolled their three children in the fourth, sixth, and eighth grades. Their son Paul ’87 has served on the Alumni Board for more than five years and has held several leadership positions along the way. Today, a second generation of the Genender family, Jack ’21 and George ’23, is attending school at 10600 Preston Road. 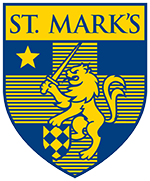 For the past 30 years, the Genenders have supported the School through the St. Mark’s Fund. Dr. Genender sees this as his way of giving back to a place that has been “inter-generationally” important to his family. Dr. Genender’s son Paul approached him one day about the new Science Center. After hearing about the project and the opportunities it would provide for future Marksmen, Dr. Genender, a retired surgeon, wanted to show his support for the sciences by making a contribution. He saw it as an opportunity not only to give to the School he cares so much about, but also to the field he dedicated his career to. As Dr. Genender reflected on the “wonderful” experience his three boys and now grandchildren have had, he explains that giving back to the School that gave his family so much is a priority. It’s important to him that future Marksmen enjoy the experiences and opportunities that his family received.